Thai Massage is a full body massage performed on a comfortable mat on the floor. No oils are used. It brings both Chinese and Ayurvedic medicine, Acupressure and reflexology into a profound healing system. Thai Massage will leave you feeling deeply nourished, relaxed and filled with energy. During your massage with Mary, she will touch upon all areas of your body, and move you through a wide variety of stretches and pressure points, while gently massaging all major muscle groups. As she works, she customizes each massage using her extensive background in reiki, swedish massage, acupressure, meditation and Thai Massage. In your session, you will receive a full-body, toe to head, massage tailored to your needs. It is important to know that the practioner uses her feet and legs as well as her arms and hands throughout the treatment. In addition to palming and thumbing techniques, the practioner incorporates rhythmic motion, stretching, and, breathwork in an effort to coax the recipient into a deeply relaxed or meditative state. 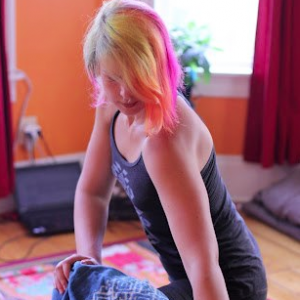 Not only does Thai Yoga Massage promote relaxation and stress reduction, but it also helps to relieve muscle tension and pain, improve mobility and muscle tone, reduce joint stiffness, and revitalize internal systems. Mary has travelled and lived in various Asian countries, including Thailand, Japan, and Burma, where she studied and practiced Yoga and Meditation. Her passion for Thai Massage started in Thailand. As well as receiving Thai Massage regularly, she studied and practiced with Masters in the United States. She has taken courses in Foot Reflexology, Swedish Massage, and Reiki, and has been studying and practicing Yoga for over 5 years. Sliding scale rates do not apply on weekends or for home visits. All rates include taxes and include studio sessions in Cambridge, Somerville or Boston as well as home visits. Cash or cheque accepted for home-visits.